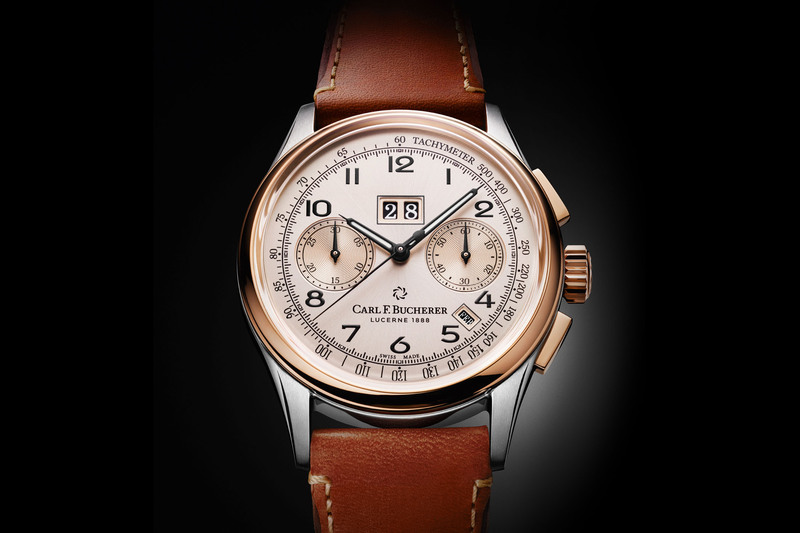 A 1956 Bucherer bi-compax chronograph is revived and enhanced with annual calendar functions. 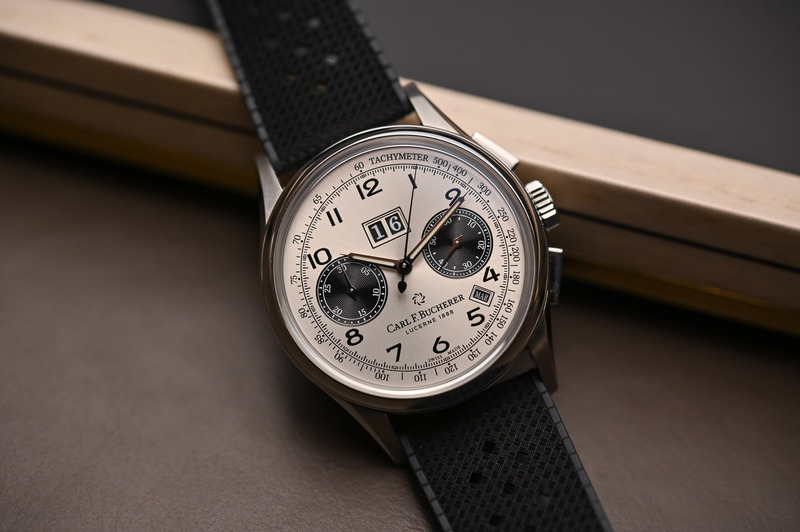 Carl F. Bucherer dips into its archives and breathes new life into a 1956 bi-compax chronograph with the release of the Heritage BiCompax Annual. Produced in two limited editions of 888 pieces, the Heritage BiCompax Annual is the second member of the Heritage Line designed to showcase the brand’s technology housed in designs inspired by watches from the mid-20th century. Revisited in a 41mm format, the Heritage BiCompax Annual pays tribute to its forbear but pops an annual calendar into the mix. 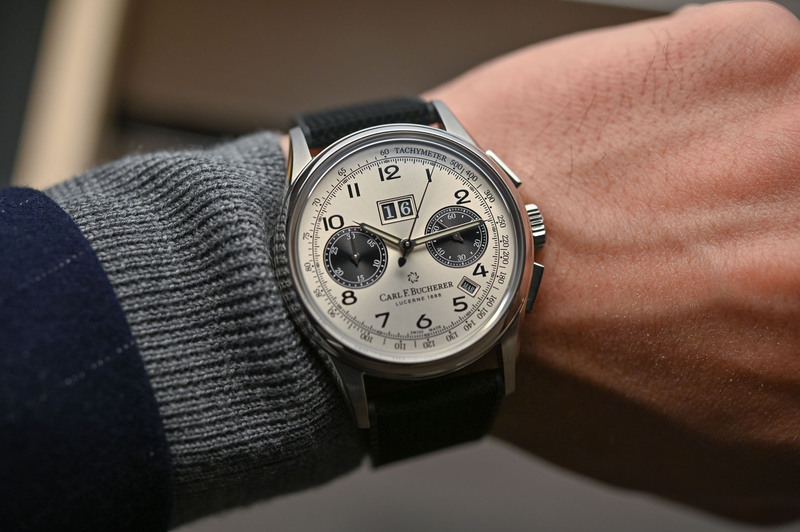 Two very desirable complications in an impeccably stylish package at a price that has nothing to do with other Maisons adept at these combinations, we were lucky enough to get some hands-on time with this exceptional retro revival. 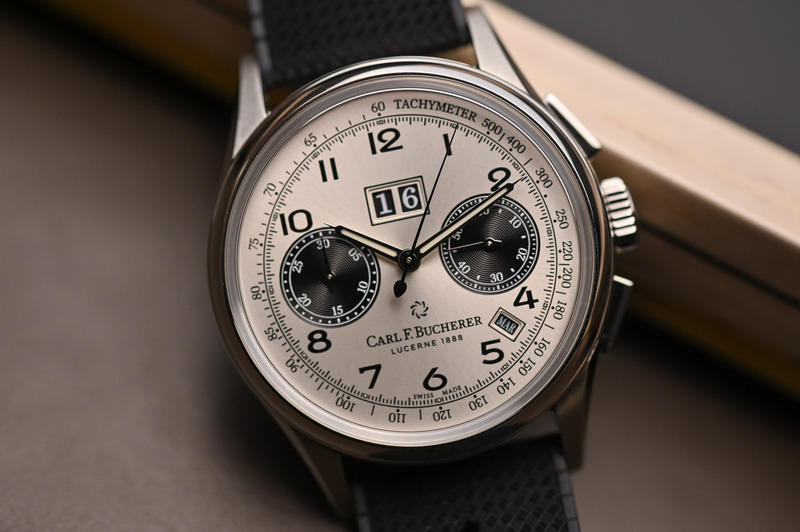 While events like Switzerland winning the first Eurovision Song Contest might be best be forgotten, 1956 was also the year Carl F. Bucherer introduced its 34mm bi-compax chronograph. 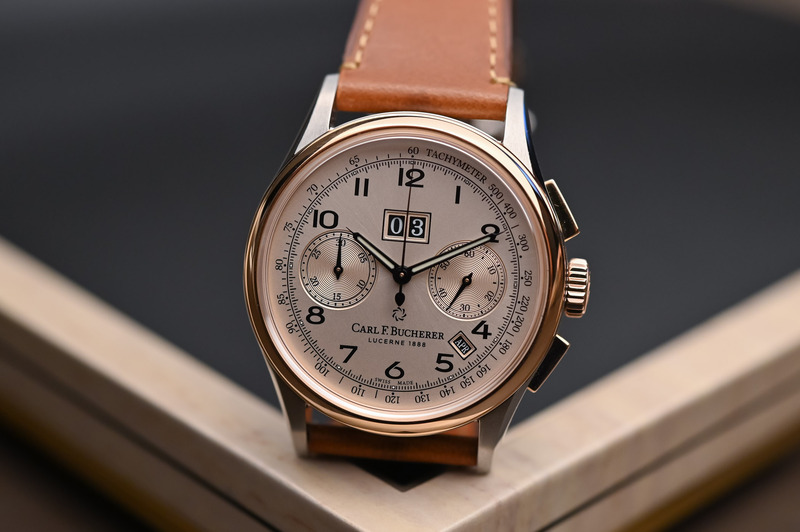 Already ahead of the game with its two-tone aesthetics, the chronograph came with a gold-plated case and a ‘salmon’ pink dial with protruding rectangular push pieces and a large crown. 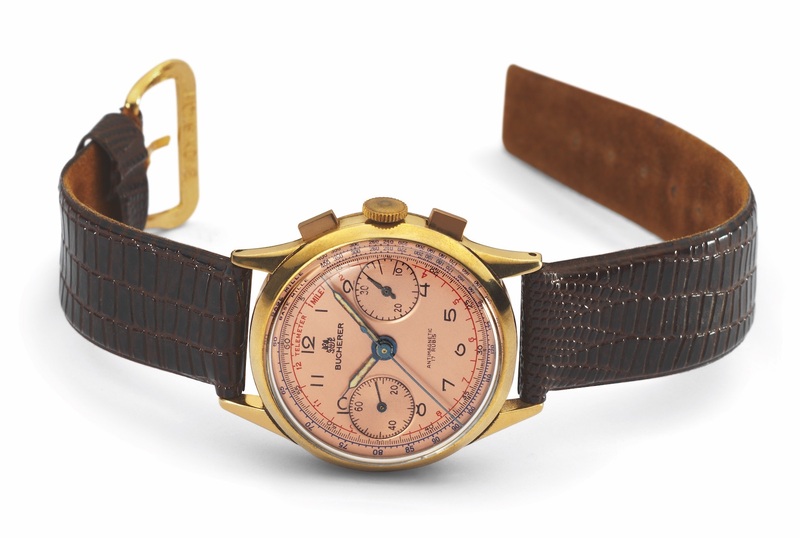 The juxtaposition of a fancy gold trimmed case and tool watch functionality clearly positioned the model as an elegant gentlemen’s chronograph. The 1956 Bi-Compax Chronograph by Carl F. Bucherer, which serves an inspiration for the Heritage BiCompax Annual. 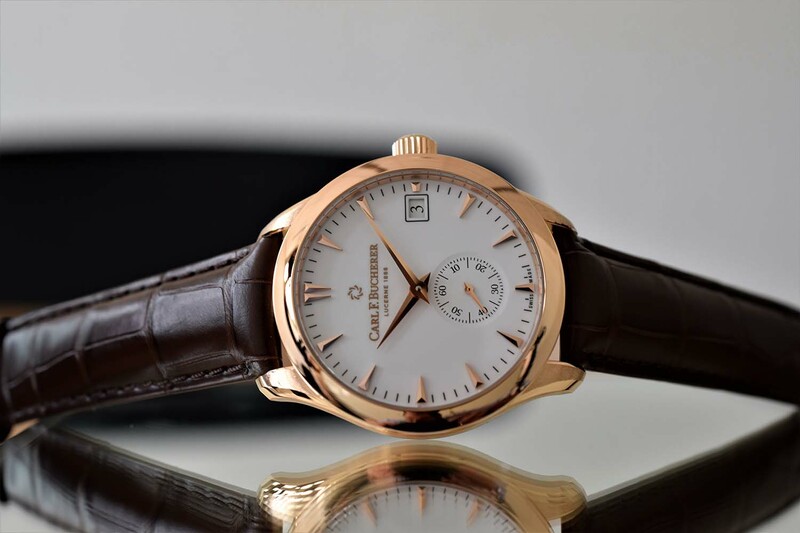 Presented in a choice of two-tone steel and rose gold or steel with a panda-style dial, the shape of the case is similar to the 1956 model but has been increased to 41mm, a diameter that is more in tune with the times but which purists still might consider 2mm too big – still, it remains easily wearable. The new watch has inherited the rectangular chronograph pushers of its ancestor but reproduced in a more stylized version. The pushers are lower in height and feature rounded, polished surfaces that look more elegant than the sharp Lego brick pushers of the original. The case finishes are beautiful with a polished bezel, crown, and pushers, and contrasting satin-brushed case bands and lugs. Although both versions play the vintage card extremely well, the two-tone rose gold and steel, with its warm rose/champagne dial, was my favourite and the closest in spirit to the original. For others on the MONOCHROME team with less of a taste for two-tone watches, the all-steel version with its black totalisers and sportier more technical vibe was their favourite. To consolidate the sporty mood of the steel model, the watch comes on an embossed rubber strap while the more elegant and warmer rose gold and steel comes on a brown calfksin strap, both with a steel folding pin buckle. Reminiscent of watches from the 1950s, the dial is protected by a pronounced double-domed crystal, in this case, made from sapphire and treated with anti-reflective coating. The dial is where the retro spirit really comes forward. 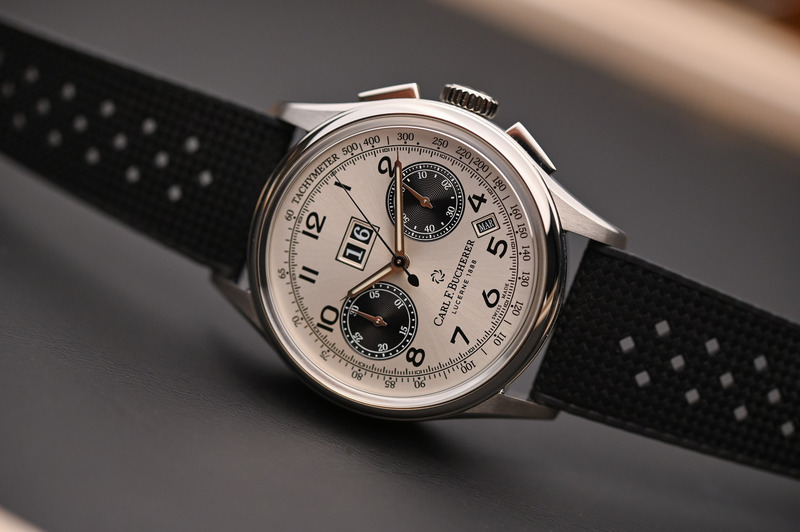 The layout of the dial is practically identical to the earlier model with its snailed bi-compax counters at 3 and 9 o’clock (black for the steel and golden for the two-tone), syringe hour and minute hands filled with lume, and the super cool retro Arabic hour numerals (just check out how elegant the 6 and 12 numerals look!) In contrast, the original double telemeter scales have been replaced with a tachymeter scale and the logo and company name have changed position and been modernised. 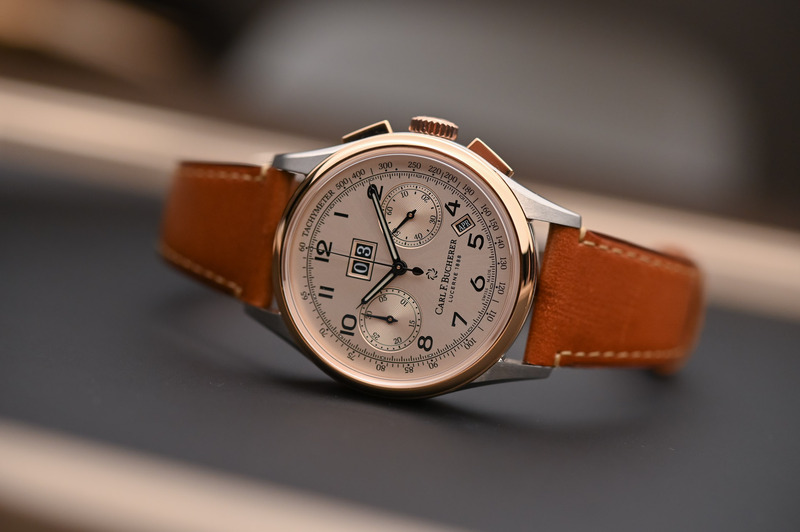 Bucherer could have been content with a faithful re-edition of its 1956 bi-compax chrono for the vintage-hungry market, but since the aim of the Heritage Line is to show off the brand’s technical prowess, the watch boasts an annual calendar module on top of the automatic chrono movement. What is surprising though is the way this additional function has been cleverly incorporated without tainting the convincing retro vibe. Heritage reissues are booming and any brand with 50 years plus under its belt is digging into its archives to see if there are any models that could be spruced up as the latest retro revival piece. 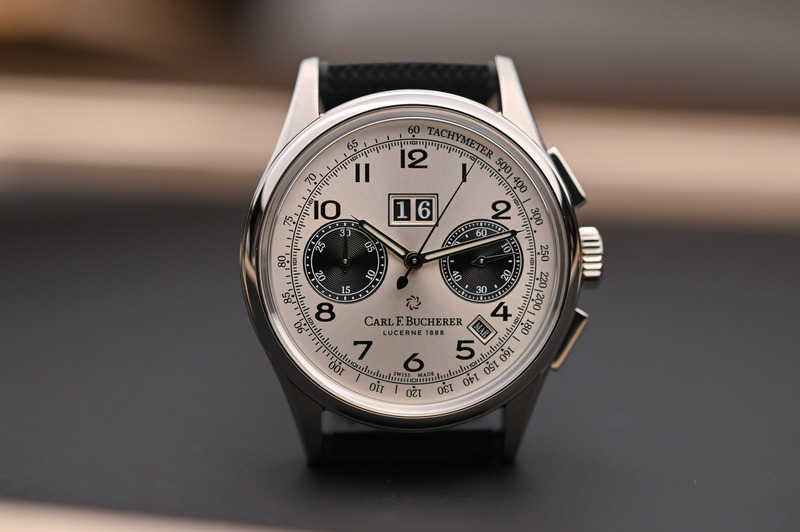 Carl F. Bucherer introduced its Heritage Line in 2018 to draw attention to the fact that the brand has been around for more than 130 years, hence the watches in this collection have all been released in editions revolving around the number 8 corresponding to the founding year of CFB in 1888. 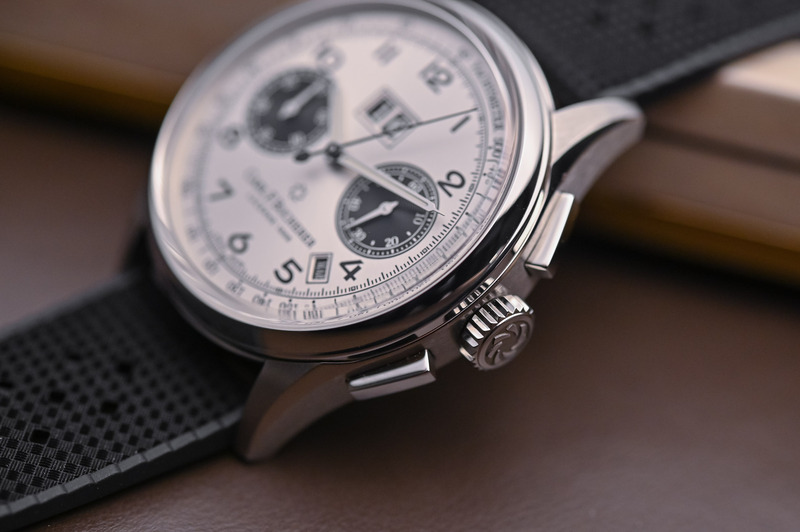 The idea behind the Heritage Line is to release limited editions that showcase the brand’s technology or hark back to some of the brand’s designs of the mid-20th century. The first timepiece in the Heritage Collection was the Tourbillon Double Peripheral, an elegant timepiece incorporating the brand’s signature peripheral technology, fully explained in our video or in Xavier’s in-depth article. Admittedly, one feature of a traditional annual calendar – the day of the week – has been suppressed, no doubt in the name of legibility and elegance. The two calendar indications are the big date window just below noon and a discreet rectangular aperture lodged between 4 and 5 o’clock for the month. Because they are managed by an annual calendar complication below, they will only need one adjustment a year. As you know, an annual calendar automatically accounts for months with 30 and 31 days and only needs to be adjusted at the end of February. If you look closely at the big date and month windows, you will see the level of detail that has gone into them with their bevelled frames outlined in black and highlighted on the interior with a thin golden or silver line, depending on the model. The fact that the background is black, and the numerals and month white, makes them very easy to read. The use of lume also aids legibility enormously and in addition to the hour and minute hands, there is a small blob of lume below the Arabic numerals. 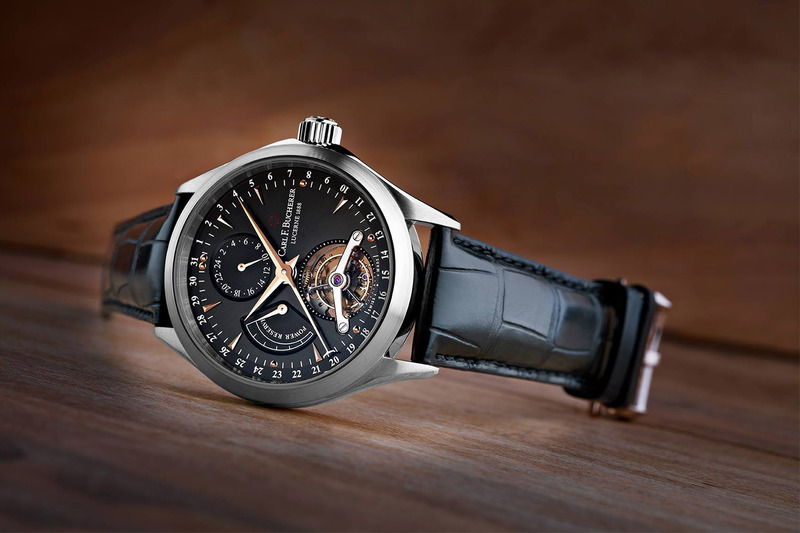 The watch is fitted with an automatic ETA-based (2894) chronograph base movement with an extra annual calendar module and a power reserve of 42 hours. 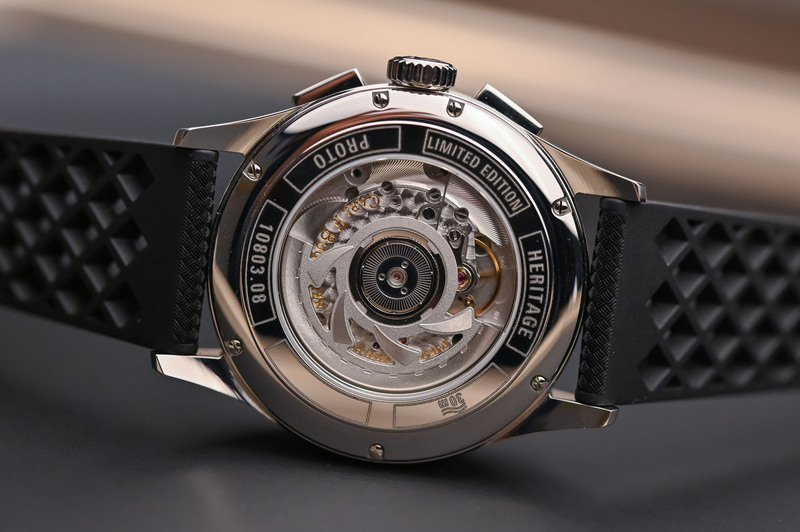 Obviously, the brand’s signature peripheral rotor has not been used on this movement but the sapphire crystal caseback reveals an openworked rotor styled to match the brand’s logo. I admire the way Bucherer has captured the vintage aura of its 1956 model and managed to add an annual calendar without overwhelming the dial. Given the chrono/calendar functionality, you have to admit that the dial is extremely legible and provides a valuable lesson in restraint. 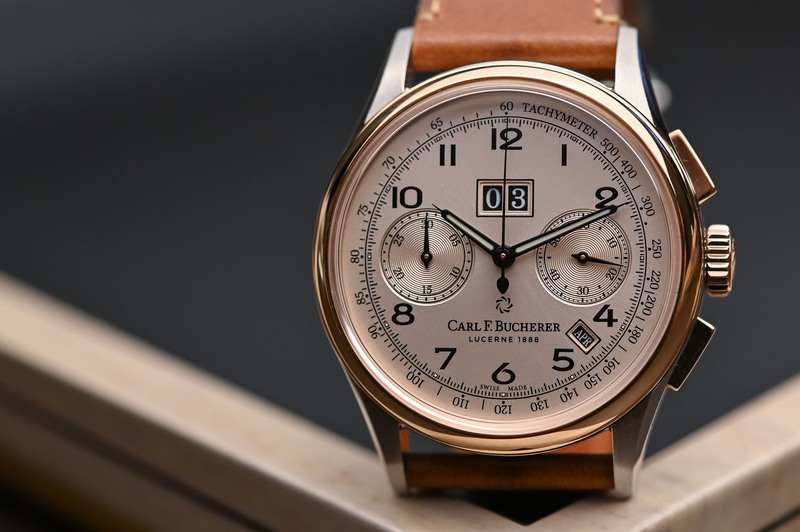 The finishes are beautiful, in keeping with the Bucherer pedigree, although I wish the movement had a longer power reserve and more effort had gone into making it as “special” as the case and dial. The Heritage BiCompax Annual has a lot going on for it in terms of functionality, style, and price. Both versions of the Heritage BiCompax Annual are limited editions of 888 pieces. 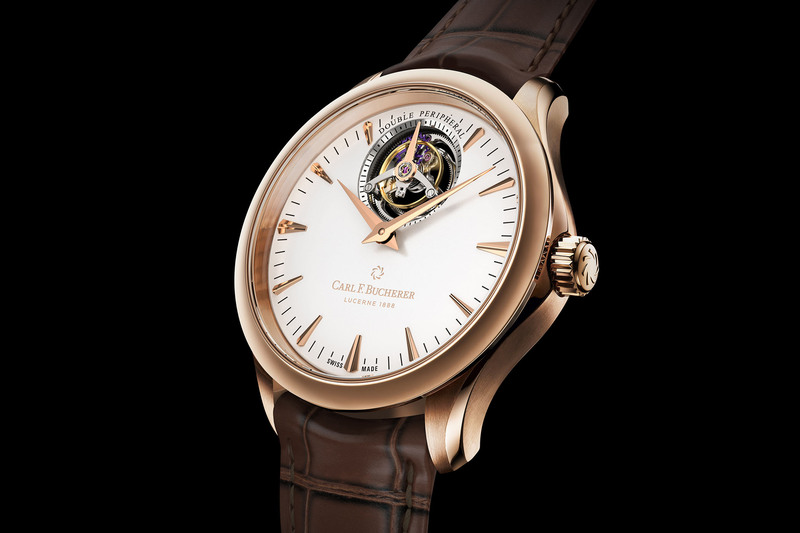 The steel and gold model will retail for CHF 10,500 and the steel model for CHF 6,900. More information is available at www. 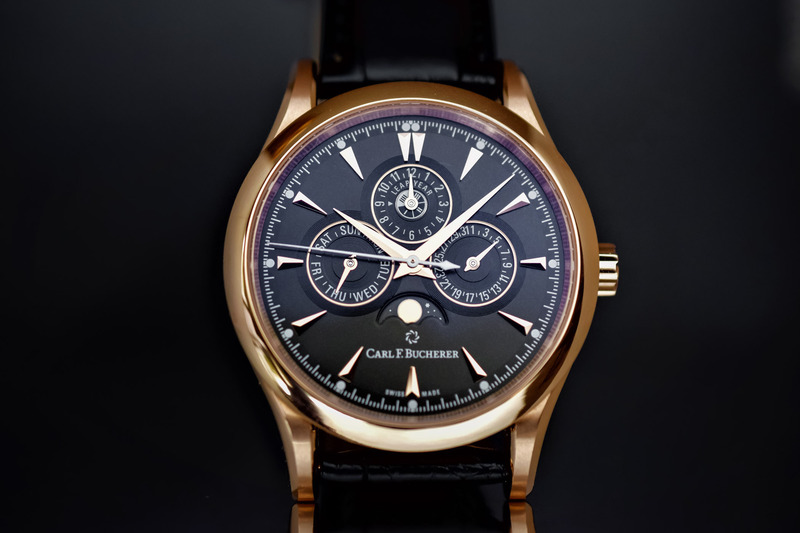 carl-f-bucherer.com. Mont blanc must be feeling rather foolish about now. 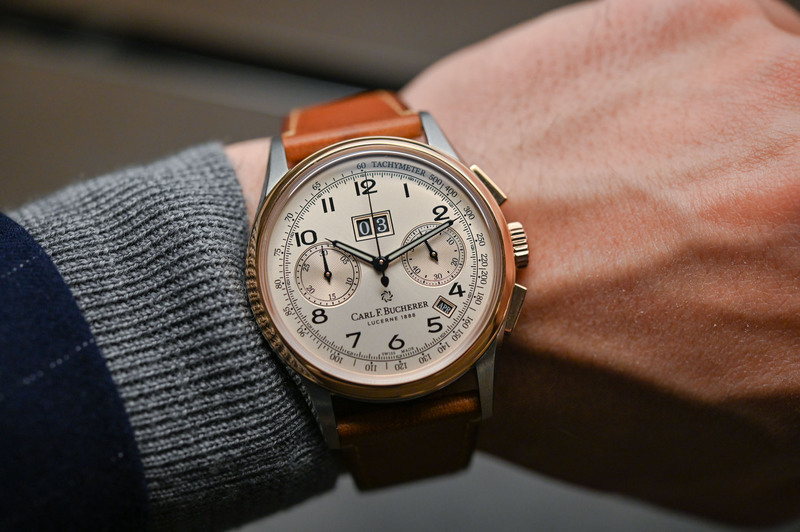 Don’t normally go for gold or leather straps but the only faults I can see are that the day of the week is much more important than the month and that is a bit on the large side. If they choose to display the weekday rather than month, it will be very tricky to adjust it. The indication of month is an obligation in order to set a annual calendar complication. Pushing by rotating the crown 3 days is verry simple and take 20 seconds, once a year!! In case of leap year, only 15 seconds are necessary…! By the way, that Watch is not an ETA 2894 modified! !